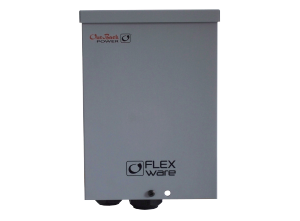 The OutBack Power FLEXware ICS combiner box is a cost-effective integrated solution for solar installations requiring basic combining and overcurrent protection needs. The FLEXware ICS offers value, simplicity, and ease of installation in a single solution. The pre-integrated design saves labor time in the field and cuts down on installation costs. With the new combiner solution, OutBack achieves another first: a single-brand solution that is UL-1741 listed from roof to battery. This makes OutBack truly “one stop shopping” for any system installer or designer looking for a safe, fully-compliant solution.